If I thought 2016 was to begin its stewardship of the next 12 months in a dignified manner, I’m thinking again. It’s only two weeks old yet the New Year has not so much been a nervous new-kid at school as barrelling over the horizon, ranting like a possessed Tasmanian devil. What’s exciting though is that it’s the relentless rise of expectations by customers, shareholders and employees that is generating the energy. And where expectations rise, the year has already shown that falling short has an air of inevitability about it. Ofwat, Britain’s water regulator, has been heavily criticised by MPs for failing to protect consumer interests and allowing companies to make excess profits. Fitbit’s stock dropped to an all-time low when its new Blaze smartwatch failed to give analysts reassurance that it had a competitive advantage. Meanwhile, clothing retailer Next blamed the weather for weaker sales and VW, not surprisingly, didn’t have enough goodwill in the bank to cover the cost in sales of its childish behaviour. I’ve even had communications from Marketing industry bodies extolling the virtues of Customer Experience with an email from the infamous NO REPLY. Tolerance for such performance is wearing thin but surely companies now have access to the technology and data that can resolve such short-comings? Over in the US, January’s annual Consumer Electronic Show is heralded as the crystal ball for the technology that we will find irresistible. On show were drones that will carry people, rollable TV screens and cars that turn the house lights on as you approach home. Laptop bags with solar panels on the outside will charge whatever is on the inside, while fridges have TV screens on the door to see what’s going off inside. Yes, technology and data can solve problems we didn’t know we had (and still don’t) but if we can have people walking around in space customers can be forgiven for asking “Why is we still get poor service from our utility company, our transport operator or our local restaurant?”. Some of these companies may say, “We’re ok, we‘re making a profit, we have staff that know what they are doing and we have satisfied customers”. They might congratulate themselves for staying focused on getting satisfaction levels as high as they can on the easiest things to measure. Others see Customer Experience as a fluffy addition to BAU, not the driver of it. But as the bar of expectations rise, those who don’t move fall backwards in relative terms. Complacency; the sweeper truck at the back of the commercial marathon. Without the right individual and corporate mind-set, things won’t change. They would have done by now if that were the case. Customer Experience has been the “new battleground” for years. Lior Arussy wrote about Customer Experience Strategy as the first iPad was being launched in 2010; Colin Shaw before that in 2002. The German watersports and surfing company called “F2” – Fun & Function – was set up in 1981. And even the Romans knew that great architecture was a combination of functional living, making life easy for its inhabitants and that it had to provoke positive emotional responses. Yet just this week I find a car-park meter saying “Overpayment welcome, no-change given”. 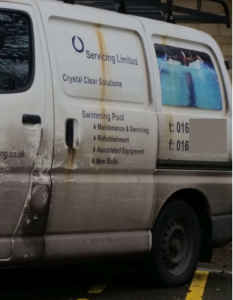 I see swimming pool cleaning vans that look like they’ve run through a peat bog. And I get a bill from my energy company saying my monthly payment has gone up yet I’m also several hundred pounds in credit – that’s if I’ve understood the bill properly of course. What do those experiences of the brand say about it? At best, they are frustrating because they simply shouldn’t happen in today’s world. At worst, they are showing me contempt, in which case I won’t be back and if they can’t work it out for themselves then they don’t deserve to know why. Whatever technology or data capabilities we have, the companies who get it right have been, are and will be those who have a healthy mix of three key ingredients: – a rich and empathetic customer understanding; leaders, employees and partners who are motivated and who get it; and a culture in which Customer Experience thinking is allowed to flourish. 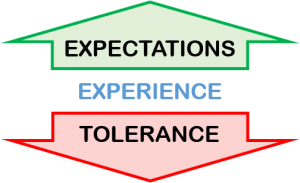 To keep the fire burning will in no small amount fall to Customer Experience professionals. Their challenge and opportunity in equal measure is to keep their complex businesses above the bar of rising basic expectations. They have to push the ambition upwards with one hand while dragging the delivery up with the other. 2016’s short history has already shown us that only when the basics are sorted should our attention turn to the so-called “Wow!” experiences. We know that if a business does what it does right every time that can be a “Wow!” in itself. So before making a bolt for the future and tripping over the horizon, the focus needs to be on solving the right problems; being good at the simple things that people expect you to be good at. It’s easier said than done, but the thinking really should be that simple. Are there any specific CX topics you’d like to see covered?